Over the past thirty years Geoffrey Dening before beginning Goingtoplaces.com in 2016, built businesses in several industries, working as a manager, entertainer and publisher. His first jobs were delivering motel breakfast trays, before catching the bus at 8am to travel 45km to Kingston Area School and washing dishes during school holidays at the Caledonian Inn restaurant in Robe SA during the 1970s. Leaving school in 1980 to begin a decade of Administration in Local Government, leaving to work in site management in the Gold Mining industry during the 1990’s. Finishing the administration occupation with experience and understanding of a diversity of enterprises and the effort it takes to succeed. Embarking on a career connecting with consumer needs directly. Founding a publishing enterprise in the 1990’s, printing sport art and literary magazines up until 1998. Whilst publishing also began managing artists and performing stand-up comedy. In the build up to the Millennium, Geoffrey noticed the hubbub around the change over and the influence of electronic tools in society. The time was now to establish an understanding of the digital industry. 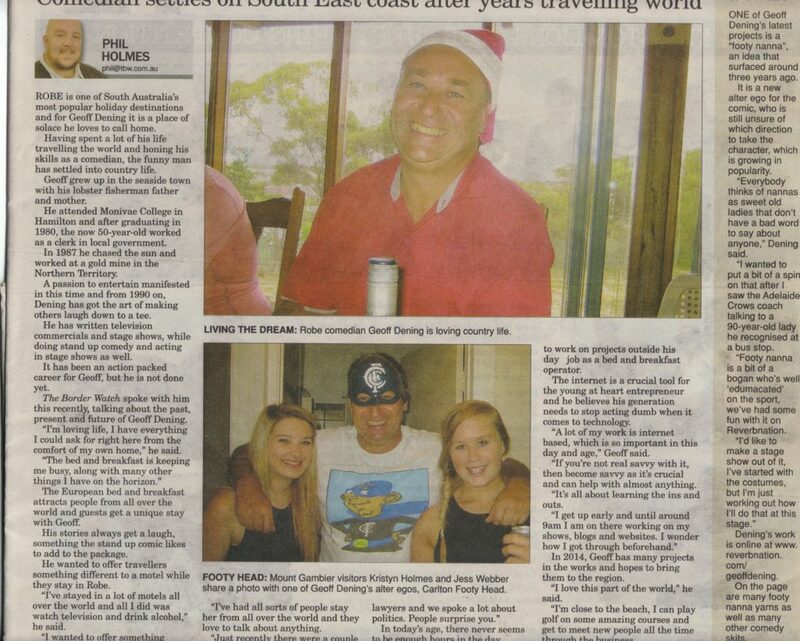 He returned to Robe in 2002 to begin his redirection. By 2004 the study and education had been done and the first practical experience of digital production began. In 2008 his YouTube channel was one of the first 2500 in Australia to qualify for advertising by Google. As well as having his recordings on iTunes and Amazon and other online download sites. A little bit about the idea and what made Geoffrey Dening decide to take the plunge and make it happen? After setting up and developing a successful BnB accommodation business in 2012, the close association from hosting guests gave Geoffrey an invaluable insight into their needs as travelers. With 80% of guests international travelers, the need for information on places to go and things to do was a regular verbal service supplied, supported with brochures and magazines. The disdain and lack of use of the paper based information became particularly obvious by mid 2015. Guests first choice was to look for online information. Geoffrey looked around and found there was no place specific information apps available and he had the knowledge and capability to develop them. This and the excitement of creating something Australian to service our travellers was all it took to leap into action. 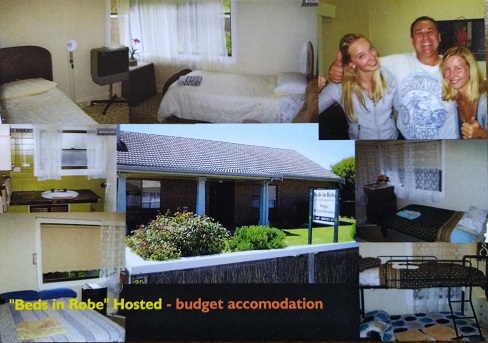 The Robe SA app (published August 2016 to Google and iTunes store) was evolved from the previous years of travellers accommodation, on Airbnb, “Beds in Robe”. 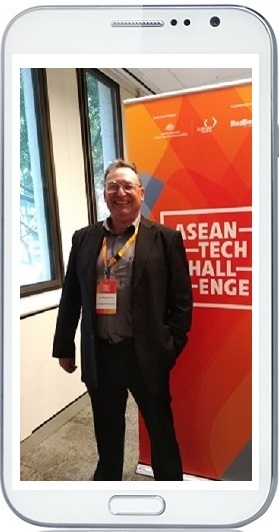 Growing up in the tourist destination and socializing as well as working with visitors over a couple of decades certainly added to the knowledge in putting together the App. Beginning with a user base from his own guests, then Facebook promotion, building to paid google Adsense listing. 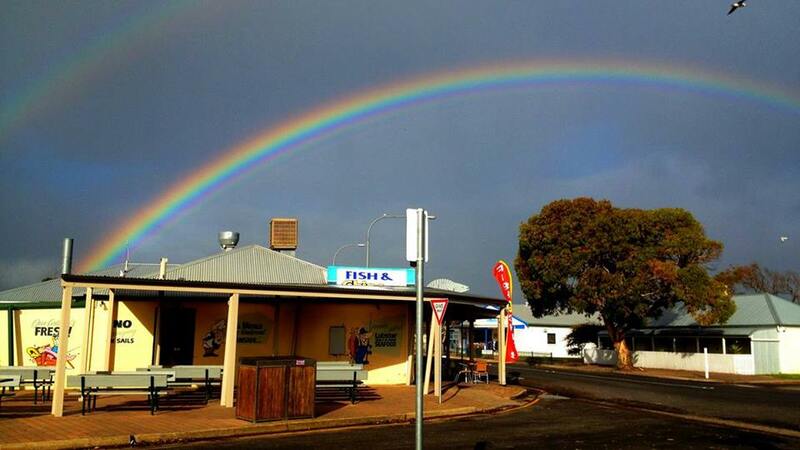 Funded by paid for listings from small to large scale businesses in Robe enough was earnt in the first two years to publish Great Ocean Road, Barossa Valley, Kangaroo Island and Limestone Coast apps. 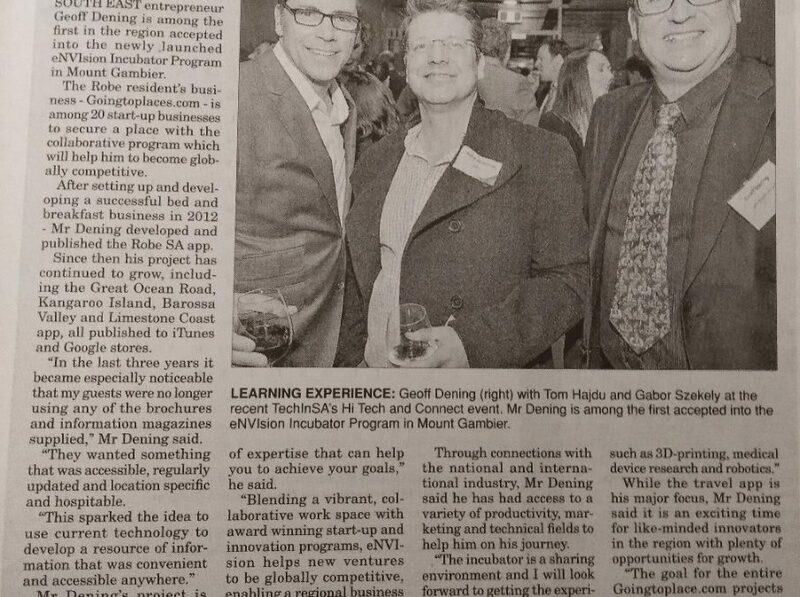 With the Mount Gambier app now available in google store and the iOS version for iPhones currently in review. Entries are not limited to the Tourism Industry businesses of hospitality and accommodation, whole communities benefit from tourism, many operators are aware of this and support the apps by listing. It is an information service and listing price developed by a Hospitality and Industry savvy business man. This is why the listing price is designed to suit the regions specifically and kept minimal. Too often excessive advertising charges are imposed by which do not provide a value for money service. 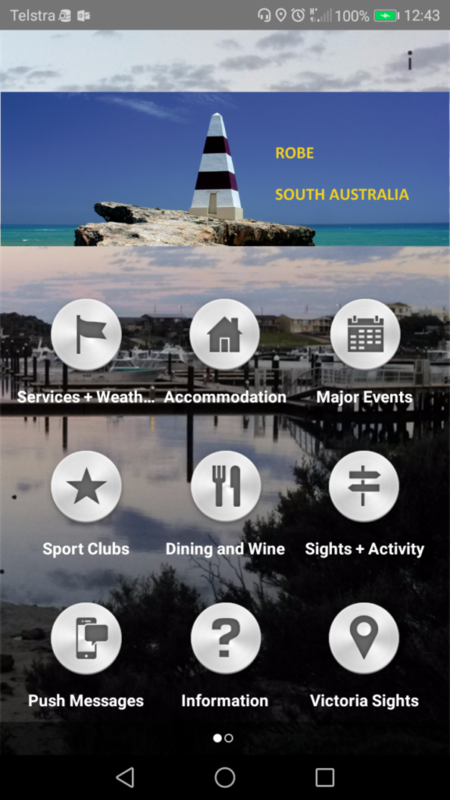 The app includes health services, building and construction, sport and adventure activity businesses. (this is a cross section of our existing paying customers.) As well as free listing of activities, community events and related information. This provides visitors with the details to have the experience of being part of the community they are visiting and enjoy the local lifestyle as they travel through. 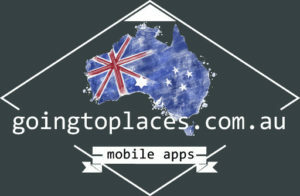 Goingtoplaces app eco system came from identifying that domestic and international travelers are moving away from the previously accepted hard copy of information on paper for finding products, services and facilities. Now reaching straight for their phone or tablet and searching online. Our apps are right there in the palm of their hand. Not paper based with outdated information or printing errors. Forgotten and discarded cluttering up cars, handbags, getting blown away in the wind, torn or misplaced. Many small to medium sized businesses are limited with digital promotion simply because of the lack of time to do the work as self employed service industry operators. There is still a reliance on static printed materials. Sitting among the myriad of other brochures where ever they are placed. Businesses require an effective, value for money advertising medium which our apps deliver. The app ecosystem is based on an industry tenet of personal service and management. Delivering value for money to advertise the listed businesses information and the specific destinations. Growing an all inclusive active digital media product. Covering the original core of services for travelers and residents. Already building in an interactive connection medium of Push (SMS )messages direct to users phones. Also including news and event information to parallel the print information of communities in the past, of local newspapers and periodical visitor magazines. What has been achieved so far. At the minute there are 6000 plus downloads of the apps published. All connected in our ecosystem based upon years of research into where travellers were going to and from on their holidays. 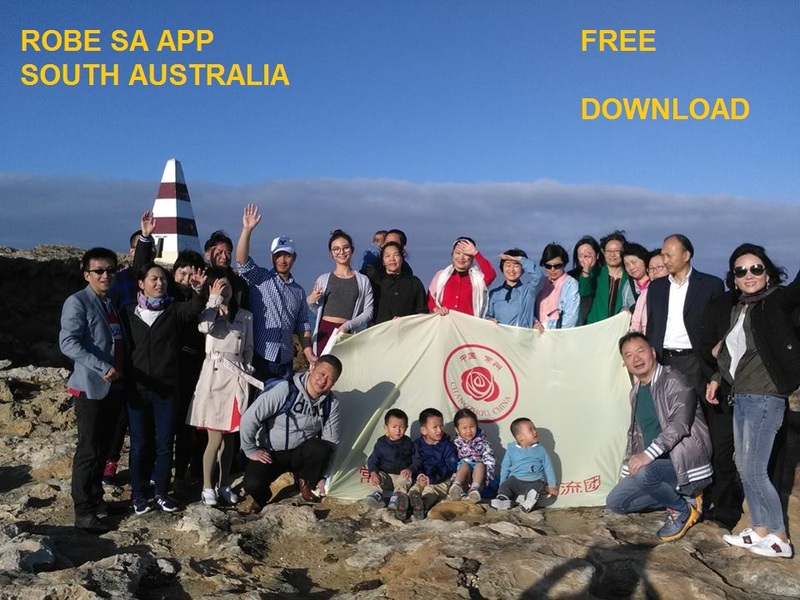 The first published in August 2016 on the town of Robe SA, followed by Great Ocean Road Vic and Kangaroo Island SA published in December 2016. Then in January 2017 Barossa Valley SA , then January 2018, Limestone Coast SA. 28.5% Other Information accommodation, community services and events. An agreement has been reached with Veterans SA through the app eco system to support reintegration, rehabilitation and employment of returned soldiers through the app platform. All apps are published in iTunes and Google stores. No glitches and product failures since 2016. With no active paid promotion at the minute, the downloads are increasing organically with user demand. 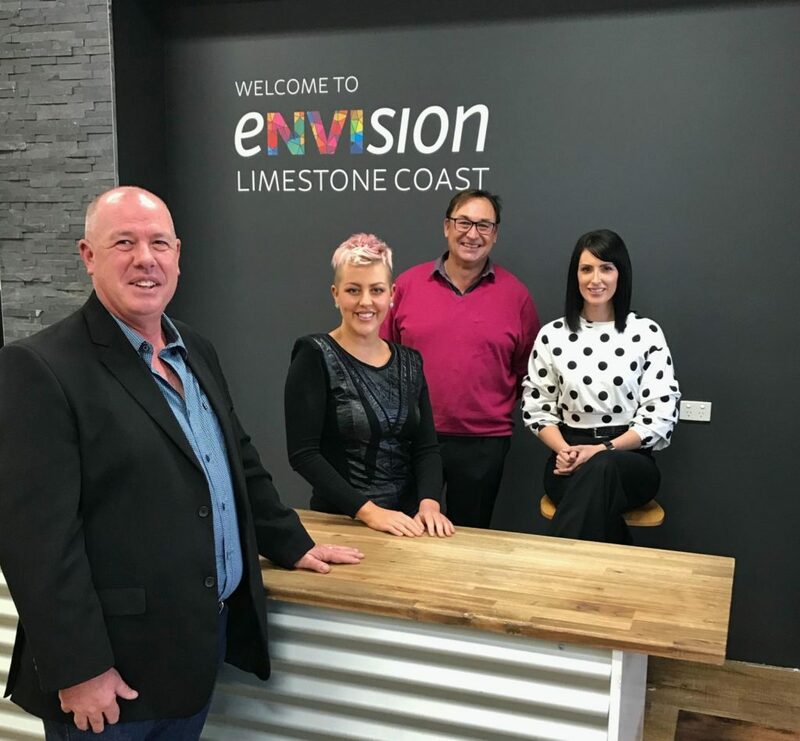 Inaugural Alumni of New Venture Institute Accelerator in the Limestone Coast 2018 part of the Flinders University regional development initiative. management following the building of the new holes. The past three years has seen the club course established as a growing tourism destination in the community. 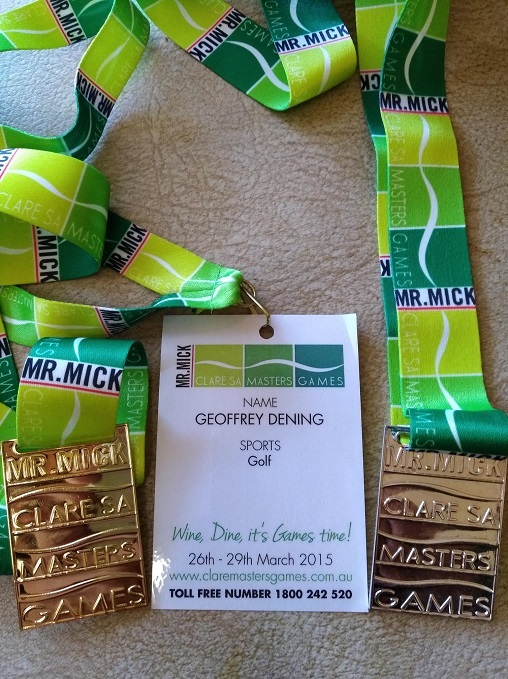 Also Geoffrey is an accomplished golfer, winning the club A grade championship in consecutive years 2017 and 2018 and gold and silver medals in Masters Games. The next stage of growth in the app ecosystem has began. . Having already built an established user base for customers to access. Now consolidating the existing apps to their potential.